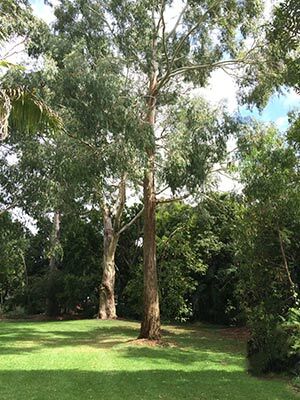 Also known as the Manna Gum, Eucalyptus viminalis is classified into three different sub species with the main differences being in final height and size as well as soil tolerance. Found from New South Wales through Victoria to south Australia, as well as in Tasmania the tree also carries common names of ‘Ribbon Gum and ‘White Gum’. Growth habit will vary from a tall upright tree to shorter spreading tree depending on sub species, soil and climate. Eucalyptus viminalis ssp. viminalis is one of the tallest of all of the Eucalypts and its main commercial use is in timber production with the timber being valued for general construction work with some use as flooring and in furniture. All species are very attractive to birds and bees, Eucalyptus viminalis is valued for honey production. All species find uses as a large shade tree and are also suited create shelter belts on rural properties. Eucalyptus viminalis ssp cygnetensis and Eucalyptus viminalis ssp. pryoriana have seen increasing use in coastal areas where they cope well with the sandy soils and general coastal conditions. E. viminalis ssp. viminalis – This is the most widely found species and also the largest, van reach 50 in height. E. viminalis ssp cygnetensis – Smaller growing to around 10m, grows well in sandy soils. Soil – Humus rich moist for good growth, will cope with poor soil, however growth will be slower and smaller. Foliage – Deep green glossy.